The Independent Living Learning Center (ILLC), Davao City and the Kid’s Nook Integrated School (KNIS), Iloilo City were visited by ASP Executive Director Ranil Sorongon in May 2013. These institutions are among the 28 partners in the implementation of the "Educating Children with Disabilities of their Rights Using the Digital Talking Books", funded by Australian Aid. Director Sorongon personally met with Ms. Luche Lamela and Ms. Cheene Manalo, the teachers of the learning sessions of ILLC to get their observations, feedbacks and recommendations on how to improve the different aspects of the project. There were 11 CWDs who joined the project from ILLC. 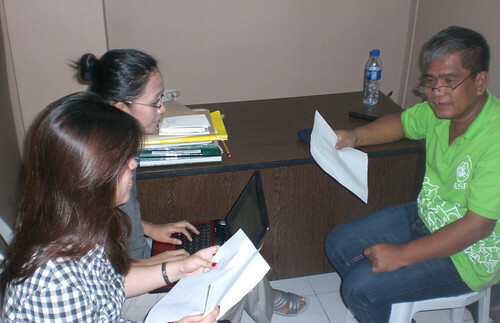 A day after Davao, Director Sorongon proceeded to Iloilo City to meet with the couple Harold and Teena Derequito. Harold was the project coordinator and Teena is the school head of KNIS. The couple was so happy that their school was among the few that were chosen to become partners and they had 17 students who join the project. They were the one who first finished the learning sessions and has submitted the video documentation of the sessions. The video depicted the enthusiasm and happiness of the children during the sessions. After the luncheon meeting, the couple brought Director Sorongon to the Breaking Barriers for Children and Youth Project (BBCY) of Iloilo City. The group was very fortunate to meet with Ms. Bless Mabilog, the project head, and the beneficiaries who were celebrating their anniversary. BBCY signified their interest to join the ASP's children rights project. As an expression of gratitude and appreciation, Director Sorongon gave the certificate of recognition to the teachers who facilitated the learning sessions and to the two institutions as project partners. He also handed a free copy of a DVD containing the learning stories and the teacher’s manual to the said schools. It will be used to teach new students with and with disabilities of their rights even after the project ended.